Review the information below to learn how to connect your Xbox 360 E console to a sound system. 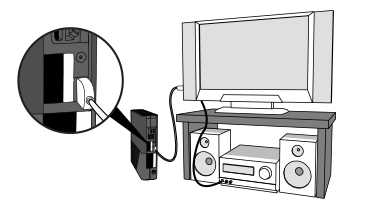 Note If you connect your console directly to your TV with an HDMI cable, you'll need a standard stereo audio cable that connects your TV directly to your sound system. Cable requirements can vary by manufacturer; see your TV manual for details about how to output audio to an external source. Connect to a sound system using a standard stereo audio cable.